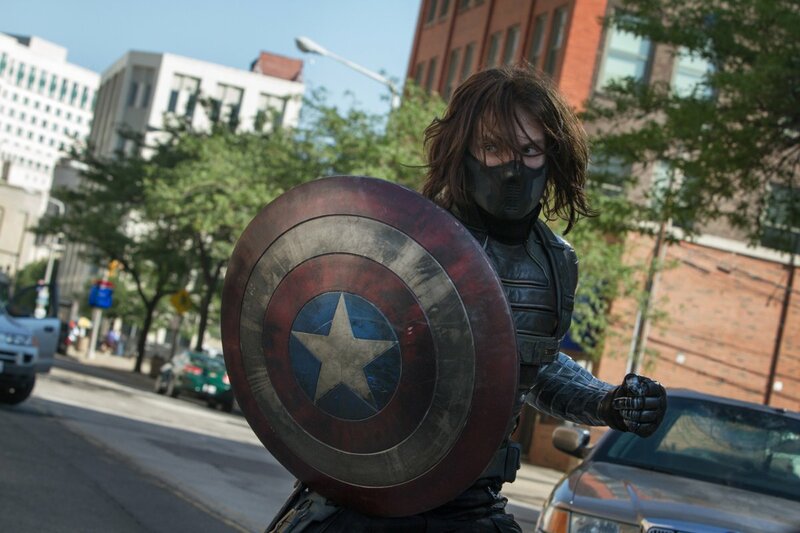 The Winter Soldier (played by Sebastian Stan) is a formidable for Captain America. There’s a sense with “Captain America: The Winter Soldier” that the filmmakers went to especially great lengths to make a film that will do more than wow audiences with over the top superhero action and special effects, their aim was to also captivate audiences with an enthralling story. Mission accomplished. The first Captain America film, one of the better of the Marvel Studios franchise of comic book adaptations, needed to lay the groundwork for Cap’s story and define the character for mass audiences who may have only been vaguely familiar with the Star-Spangled hero. With that film and 2012’s “Avengers” behind us, we get to catch up with a modern day Cap who is still struggling with being a man out of time and a reluctant watchdog for S.H.I.E.L.D. Director, Nick Fury. The film’s directors, Anthony and Joe Russo, and writing team, Christopher Markus and Stephen McFeely, have concocted a espionage-style story which finds Captain America (aka Steve Rogers) questioning who are his true allies. The film opens by immediately introducing Sam Wilson (played with great charm by Anthony Mackie) as Steve (played by Chris Evans) continues to outrun the pilot as they jog along the National Mall. While “The Winter Soldier” may be one of Marvel’s most dramatic efforts, one of its key winning elements is its levity. Markus and McFeely have imbued plenty of light humor into their script, from Steve’s bucket list to the suggestion that he and Black Widow (played by Scarlett Johansson) might not be big eaters. The Russo Brothers find a pitch-perfect balance of humor and drama, consistently certain of when to fit an appropriate gag in. The Russos have directed a dense action yarn with the confidence of seasoned filmmakers. Once “The Winter Soldier” gets going, which is pretty quick, it keeps rolling along, revealing its mysteries and jumping from one exciting sequence to the next. In terms of the action, it was great to see Cap in action in this film. He’s either a bullet, racing straight through walls, people, and windows, using his shield to knock anything out of his way, or he’s a skilled hand to hand combatant, fearless of any would-be opponent. 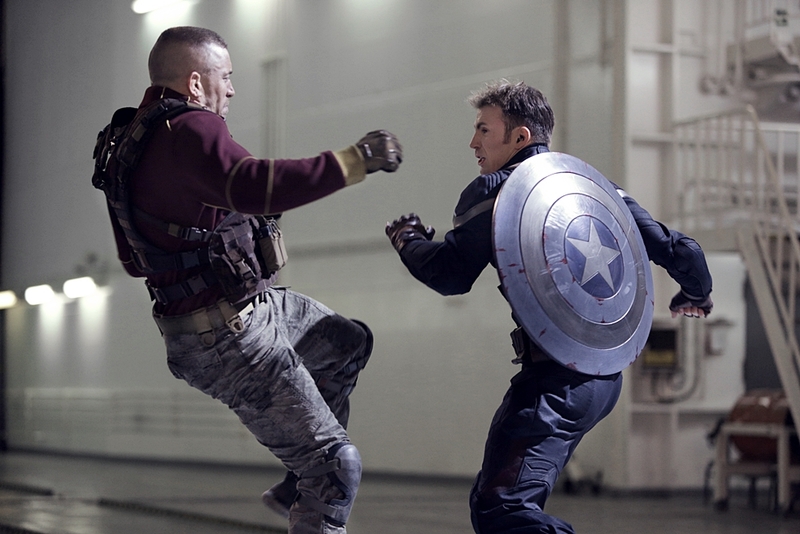 Batroc (Georges St-Pierre) and Cap (Chris Evans) go toe-to-shield in one of the many incredibly choreographed fight scenes from “The Winter Soldier”. James Young choreographs some terrific fight sequences in “The Winter Soldier”; chief among them are a street fight between Cap and the Winter Soldier (played by Sebastian Stan) and another between Cap and Georges Batroc (played by Georges St-Pierre, an Ultimate Fighting champion). After some furious kicking and leaping, Batroc goads Cap into laying down his shield to fight without weapons. What follows is the first of several excellent fight sequences where the adversaries get in close for some intense hand to hand combat that doesn’t rely on gravity-defying wire work. I don’t want to take too much away from the special-effects though, because watching Cap take down a plane with his shield spoke to my inner 12-year old. During this opening rescue sequence, involving a hijacked S.H.I.E.L.D. vessel, Steve learns Black Widow is on a secondary mission involving secret data that is also on the ship. Once back at S.H.I.E.L.D., Steve meets with Nick Fury and questions his role at the agency. Faster than you can say “plot twist” Fury finds himself under an attack led by the mysterious Winter Soldier, a masked killing machine who is known only as a myth in the assassin community. It was extremely satisfying to finally see a film where Nick Fury is able to seriously take part in the action, demonstrating why he is the head of S.H.I.E.L.D. Soon Cap is on a mission with Black Widow to track down the truth behind some suspicious activities going down within the top-secret spy organization. After appearances in “Iron Man 2” and “The Avengers”, Scarlett Johannson is given something dramatically significant to do in “The Winter Soldier”. Though we don’t learn much about Natasha Romanoff, she reveals a side of herself that is hardened and not entirely positive, which is the antithesis of Steve Rogers. And Evans, as Cap/Steve, plays the aspirational hero with coolness and complete sincerity. In the last film it was clear that Steve was born a good guy, and Evans continues to tap into that unwavering sense of goodness that too often gets lost in superhero films. There’s a scene in the finale where Cap risks his own life on the belief that his friend will ultimately do the right thing. The scene is a testament to the character we know from the comics and it is characteristic of the strength of Markus and McFeely’s excellent script. “The Winter Soldier” boasts a great cast. 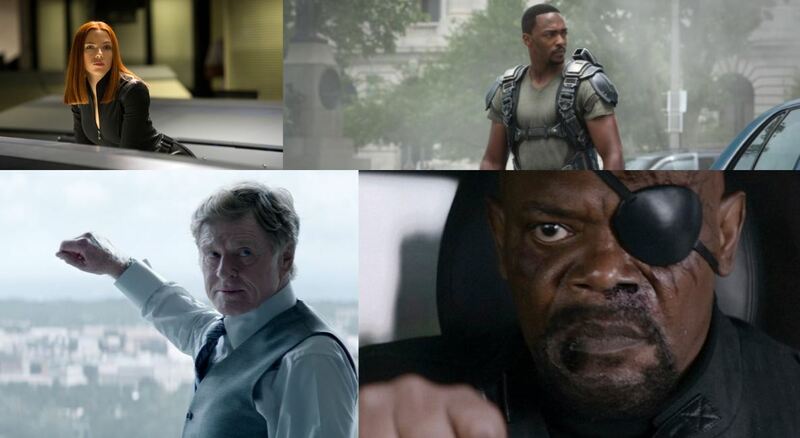 Clockwise from top left: Scarlet Johannson as Black Widow, Anthony Mackie as Falcon, Samuel L. Jackson as Nick Fury, and Robert Redford as Alexander Pierce. Robert Redford also stars in the film as Alexander Pierce, a senior S.H.I.E.L.D. official who appears concerned that Nick Fury and Steve Rogers have gone rogue. Redford, who rarely appears in more commercial fare these days, adds gravitas to the film and he plays the role refreshingly straight from beginning to end. Toby Jones also appears in a brief sequence that ought to make comic fans happy that the filmmakers have come rather close to adapting a more recognizable Arnim Zola for movie audiences. For a film subtitled “The Winter Soldier”, the film does not spend as much time as one might think exploring the character. We get the Winter Soldier’s backstory, and he appears in a few fight scenes, but the majority of the film is spent on the Cap and Black Widow’s attempt to uncover possible nefarious deeds that might be taking place within S.H.I.E.L.D. If this is a disappointment, don’t let it be. The Russos have packaged an exciting story filled with more than its fair share of twists and turns, all of which don’t feel like they’re coming from out of left field. Marvel Studios has done a solid job of stepping away from the formulaic good guy vs. bad guy storylines that are representative of superhero adaptations. “The Winter Soldier” ends having laid seeds for what will naturally follow in a third Captain America adventure, but first we’re treated to a complete and exciting adventure film filled with twists, adventure, humor, and unquestionable heroism. Cast: Chris Evans (Steve Rogers/Captain America), Scarlett Johansson (Natasha Romanoff/Black Widow), Robert Redford (Alexander Pierce), Samuel L. Jackson (Nick Fury), Sebastian Stan (Winter Soldier), Anthony Mackie (Sam Wilson/Falcon), Cobie Smulders (Maria Hill), Frank Grillo (Brock Rumlow), Emily VanCamp (Agent 13), Hayley Atwell (Peggy Carter), Toby Jones (Arnim Zola), Georges St-Pierre (Georges Batroc).